GREENVILLE, S.C. -- What's been the secret of Jaguar and Land Rover's success since Tata acquired the British luxury brands in 2008? "I suppose what I'd have to say is leaving them alone," said Ratan Tata, the soft-spoken chairman emeritus of India's wildly diversified, family-controlled industrial behemoth -- and the man who did the deal. The billionaire's humility is disarming. Indeed, the 77-year-old titan offered a rare glimpse into his management philosophy and personal style during a 42-minute chat last week at Clemson University with Automotive News Editor-in-Chief Keith Crain. He also made news. Tata said Jaguar Land Rover is considering a North American assembly plant, and that his most famous and controversial creation -- the ultracheap Tata Nano -- would be repositioned. Two years into his official retirement from the auto business, Ratan Tata continues to steal the show. After more than 20 years as chairman of the Tata empire, the retiree would hardly be expected to disappear into the Indian sunset. Tata recently invested in a new online auto retailing website for India called Cardekho.com -- envisioned as a sort of automotive Amazon.com for a giant country that does not have American-style dealer-factory franchise restrictions. He is also now pressing for a way to reposition the Nano, the $2,000 car introduced with great fanfare in 2008 but that never caught on with Indian customers. "It got branded as India's cheapest car -- not the most affordable or the best value," he said. Tata laments that the two-cylinder, single-windshield-wiper Nano missed the mark on what he wanted it to do -- provide safety to poor families who were piling entire families onto motor scooters. He says he wants to help Tata Motors remake the Nano into a more substantial car with a bigger engine, while still keeping around a $2,000 version of it, just because that's what he promised India several years ago. His forecast? Tata can export the Nano and sell 500,000 a year. Tata also continues meeting regularly with one of the world's go-to luxury-car experts, former BMW, Volvo, Jaguar and Land Rover executive Wolfgang Reitzle, about Jaguar and Land Rover products. "We meet on our own time once every month or two months, and we review all the new products from Jaguar and Land Rover," revealed Tata, visiting the U.S. last week for a rare public appearance. "He's got a very keen eye," he said of Reitzle. "He's very outspoken in terms of what he thinks we should do, and I think he's added considerable value as we move forward." And last week in South Carolina, Tata let the cat out of the bag on even bigger news: Jaguar Land Rover Group is considering building an auto assembly plant in North America. "The company is indeed looking at North America as a location for another plant," Tata told an audience at the South Carolina Automotive Summit. "Where they locate that plant, in which country or which state they locate, is something they will need to decide." Tata did not provide further information about the site search. But despite insistences that he has given up decision-making control of the family conglomerate, the world continues to view him as -- at least -- a paternal influence on the company. In retirement, he retains control of Tata's charitable foundations. As it happens, those two foundations own 65 percent of the company and hold seats on the Tata board. 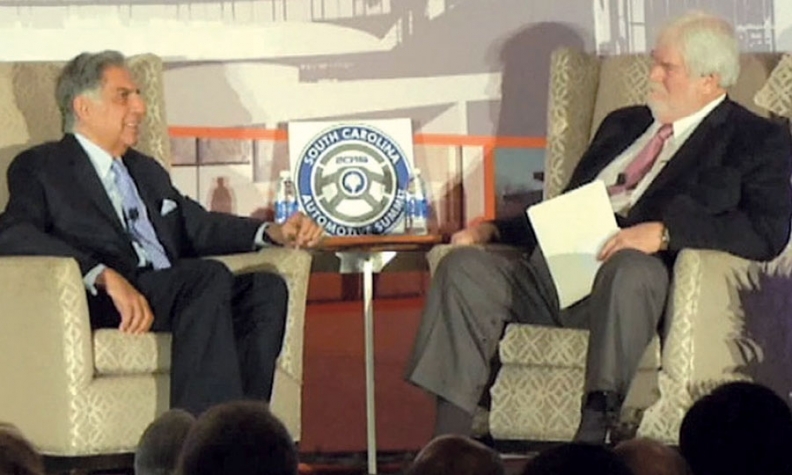 Last week, during his first visit to Greenville, Tata was feted by state and local officials and business leaders, who toasted him with raised glasses of iced tea as Clemson University awarded him an honorary doctorate in automotive engineering. And they slipped in this appeal: Should Tata ever need a U.S. location for one of its many companies, please consider Greenville -- already home to massive investments from BMW, Michelin and myriad European auto suppliers. Retired industrialist Ratan Tata, left, told Automotive News' Keith Crain that Jaguar Land Rover is looking for a site for a North American auto plant. It was no theoretical invitation. South Carolina officials immediately grasp the implications of a small luxury automaker opening a U.S. factory. In 1992, Germany's BMW AG said it would build a modest auto plant next to the Greenville airport. At that time, BMW was selling fewer than 66,000 cars a year in America. Since then, BMW has invested $6 billion in the plant, which employs 8,000 people, says Bobby Hitt, the plant's former public relations chief who has since become South Carolina's secretary of commerce. Hitt sat next to Tata at last week's luncheon. Jaguar Land Rover could be poised for the same sort of surge in global business. That is a far cry from the group's fortunes a few years ago, and it is largely thanks to Tata. The futures of Jaguar and Land Rover were dicey back in 2008 when Tata acquired the storied British brands from Ford Motor Co. for what he said was $1.6 billion. Since then, and with $3 billion in additional investment in new models, technologies and plants, the brands are excelling globally. Land Rover's U.S. sales rose just 3 percent last year to 51,465 vehicles, while Jaguar's declined 7 percent to 15,773. But the duo posted record worldwide sales of 462,678 last year, a 9 percent increase. And their United Kingdom-based management team is forecasting that a cluster of new models will push 2015 global sales to more than 500,000. In the past three years, the group has hired thousands of workers in the U.K. In October, Jaguar Land Rover opened its first non-U.K. car plant in China, and is constructing another in Brazil. The stewardship of Jaguar Land Rover has been a somewhat surprising success. Tata made no attempt to integrate the luxury companies with Tata. "What would we integrate?" he shrugged. "We make low-end cars." But he did approve all the capital spending the companies' management believed it needed to rebound. Product plans had been frozen before the acquisition, and investments halted. Tata quickly approved $2 billion in product spending. "I was convinced that when we came out of this recession we shouldn't be the same company," he says "We should be offering a new company with new products." He also met with the companies' British work force and unions to settle their worries and stop rumors that Tata intended to dismantle their factories and move production to India. His plea: "Let's work shoulder to shoulder to re-establish the glory of these two brands and not worry about whether we're going to close down plants." Tata says his main concern today is modernizing Tata's charitable foundations, which are focused on easing childhood malnutrition and improving India's rural health care. He sees Detroit's Ford Foundation -- where he was a trustee for nine years -- as a model to be emulated. He still wants to make a difference, he says. He still wants the Nano to improve the lives of Indian families. He wants Tata Motors to continue to grow to support his foundations. "I hope that in course of time," he says, "one looks back and says, 'I've made a difference.'"